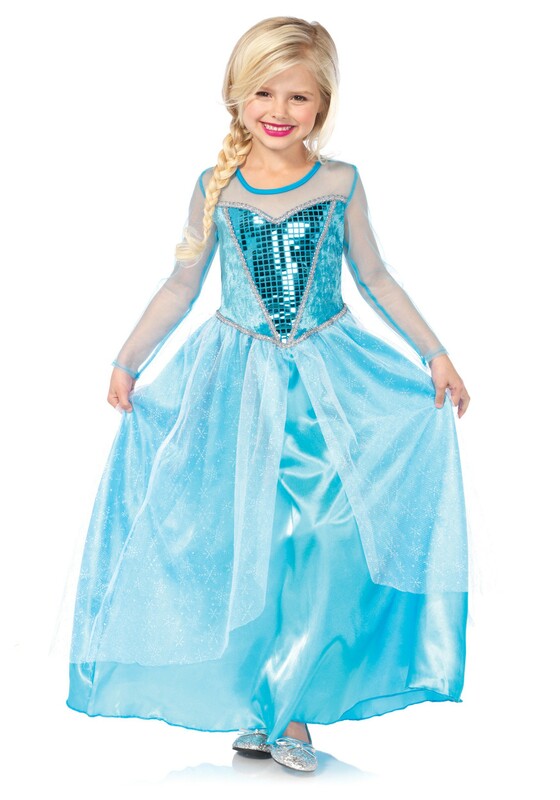 You know, we here at HalloweenCostumes.com could use an imaginative Snow Queen and her chilly powers right about now. Winter has trapped us in our office. Can you help? No less than 54 feet of snow sits swirling around outside! The howling wind is sweeping the snow into even taller piles, blustering into anyone who dares open the front door, and blocking the roads from anyone who makes it to their car. Now we are worried none of us will get home to our families. We might have to sleep on the hard floor, using all the extra fabric for pillows! Worse yet... the shipping department drank the last of the hot cocoa! If only there was some bright little girl out there brave enough to save us from all this snow... She could sweep off our cars and clear the roads, whip all those gigantic snow piles into ice castles, and finally tell the wind to quiet down. If only such a daring young Snow Queen were around, we imagine she would be twirling around in a stunning dress like this—covered in glittery silver snowflakes, of course. Can you rescue us from this snowstorm and get us home before bedtime? Okay, we believe in you... just ask for permission first! We'll be over here at the office, searching old cupboards for packets of hot cocoa.